Designed for warmth without the weight, the Noble Outfitters™ Thermothin Sock is the ultimate winter boot sock. This sock is made with 25% Thermolite® polyester fabric and 25% cotton in the foot bed for exceptional warmth and unbeatable breathability. Thermolite® is known for its light feel, yet heavy-duty performance due to hollow-core fibers that trap in air for greater insulation. Added Opti-Dry Technology wicks moisture from your skin so your feet stay comfortable all day long. 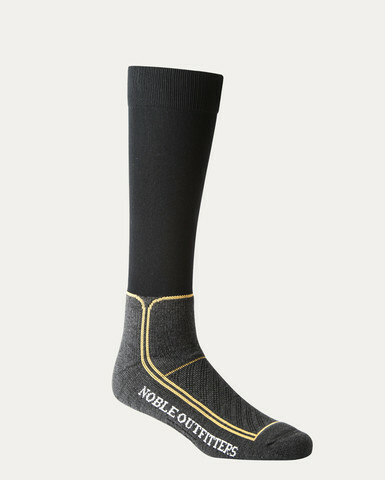 Like other Noble Outfitters™ socks, the Thermothin Sock features popular Ankle Shield padded ankle protection for boot pinch points and comfort mesh on the top of the foot for added breathability. Padded heel to toe protection and an arch compression band prevent blisters and shifting. The ultra-thin calf material and non-slip top allows this sock to stay up and never slip down.